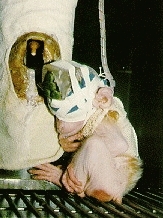 This infant monkey was rescued from an animal research laboratory. She was found in a darkened room with her eyes sewn shut. Please post this to all relevant e-mail lists and websites. (Finland) Ari Ripatti, who was imprisoned along with Eija Ripatti for alleged lab break in, has been heard to have made statements against other activists. This has led several activists being coerced into making confessions to alleged lab raids in Karttula, Tampere, and Helsinki. A trial will probably commence this summer. (Sweden) On November 6th, three eco-activists were arrested on the premises of a road building site in south Stockholm. Damage was allegedly made to vehicles and machinery. One activist, Linus Brohult, was held on remand for a couple of weeks but is now out. (US) Jacob Kenison was moved from Salt Lake City to Oklahoma and then finally to a federal prison in Arizona (refer to address below). Last news on the situation, he was being forced to wear leather work boots because he could not afford canvas shoes. If you would like to send him money towards vegan shoes, send money orders made out and sent to him at his address. Josh Ellerman, brother of Colby Ellerman (see below), will be sentenced May 6th for his alleged use of pipe bombs to destroy the Utah Fur Breeder's Coop (causing over $1 million in damages). The maximum for his "offenses" is 35 years, though the prosecution has made clear that they do not want this maximum. A defense fund is being created to support the Ellermans and other Salt Lake City prisoners - details will be posted as soon as received. Also, rumors of Josh's collusion with the authorities in implicating others are false. (UK) Michael Green has released a couple of weeks ago. (UK) Gillian Peachey was sentenced to 6 years and 9 months. She has been moved to HMP Winchester (refer to address below) after having spent 18 months on remand. *Steve Hindi is serving a 6 month sentence for his activities against a hunt in Illinois state. *Recently sentenced to 18 years for charges relating to the attempted use of incendiary devices in vivisection labs in Bristol and the successful use of incendiary devices in labs on the Isle of Wight. He is in the process of appealing this sentence. *Sentenced to 11 years for criminal damage to meat vehicles, attempted incitement, possession of explosive materials, attempted arson, and escaping from custody. *On remand charged with conspiracy to use incendiary devices to cause criminal damage, and arson on a poultry farm. *Sentenced to 7 years for possession of a shotgun and possession of items for making incendiary devices. *Sentenced to 10 years for arson with intent to endanger life. *Sentenced to 5 years for arson with recklessness. *Both sentenced to 3 years from the "GAndALF" trial, in which the state prosecuted them for their alleged part in distributing "inciting" information.